Selecting a biometric attendance system is almost as simple as identifying the needs of your organization. But it’s a little more complicated than that. Because a time clock can do more than keep an eye on attendance. With the right equipment, your clock can calculate hours, accommodate shift trading, or otherwise remain as adaptable as a classic punch-clock. Biometric technology used to suffer from a variety of critical security failings, but over the past decade it’s become reliable enough for widespread usage. It’s even become quite reliable for colder and dirtier environments. Though adding biometric technologies does make it a little more difficult to narrow down your selection due to the added complexity. Sometimes workers make mistakes punching their card. Sometimes managers make mistakes reading time cards. Automating the process of tracking hours can remove the danger of human error. Of course, sometimes it’s not an accident. Sometimes an employee might have a friend who is willing to punch their card while they’re away. That’s where you want features like biometric feedback and similar unique logins. Because there’s really no better way to eliminate buddy punching than to make it impossible to do. But what do you want to look for in a biometric time clock? One of the reasons it’s getting easier to manage biometric devices is because everything is getting integrated into Wi-Fi. That includes biometric fingerprint scanner time clocks. Having remote access to your data is almost always a good thing, which makes that kind of support a very appealing feature to many business owners. But the quality of app support and cloud support does vary widely between different time clocks. How do you actually view and interact with the data you collect through the time clock? Most devices will have some kind of physical interface for you to use. Some are built to print hard copies on paper, while others rely exclusively on digital transmission. This is another instance where what matters most is the meeting the specific needs of your own unique circumstances. 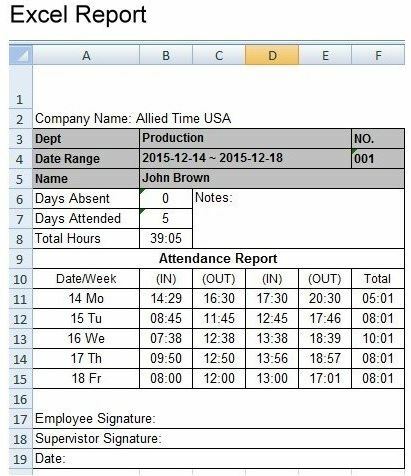 If you don’t actually need hard copies of timesheets, then you’ll be able to save an enormous amount of time, effort, and money. If you do actually need them, then you’ll want to look for printouts which are equal parts readable and economical to print. Are you trying to register eight people with the time clock, or are you trying to keep track of 80,000 people? Most fingerprint scanner time clocks will have a user limit. Some will allow you to expand that limit. Others will allow you to connect the clock alongside several fingerprint scanners into a unified network. Don’t take scalability for granted because it’s rarely available unless the manufacturer specifically mentions it. When you’re dealing with user logins, it’s worth thinking about if there are any extra security features available. For example, you might require employees to clock-in with both a badge and a fingerprint. Alternatively, you might use a time clock that requires a pin-number and fingerprints. Data security isn’t something you have to worry too much about, though you might want to know how easy it is to pull data from the clock. Speaking of security, there’s one more thing to keep in mind. Biometric scans can be used for individual users or select areas, there’s no reason to force everyone into the system. Additionally, these scanners do not actually store images of staff fingerprints. They’re really only recording strings of numbers and letters, which are then encrypted in most cases. Many biometric time clocks will leave you to figure out your own data collection. The Silver Snow is more like an all-inclusive solution. The general idea is to take the entire process of managing data off your hands, which is thanks to support from the cloud. That makes it possible to monitor employees from anywhere you’ve got a browser. Moreover, the Silver Snow was made rather specifically for eliminating human error during the reporting process, both when it comes to employees and their managers. It can report absences, vacations, tardiness, overtime, lunch breaks, and basically everything else a growing business might need to account for on timesheets. The Timedox Silver Snow doesn’t look much like a time clock; it looks more like a thermostat. The Silver Snow measures 9.5 x 8.0 x 2.8-inches, and with its simple snow-white chassis, it weighs approximately one pound. 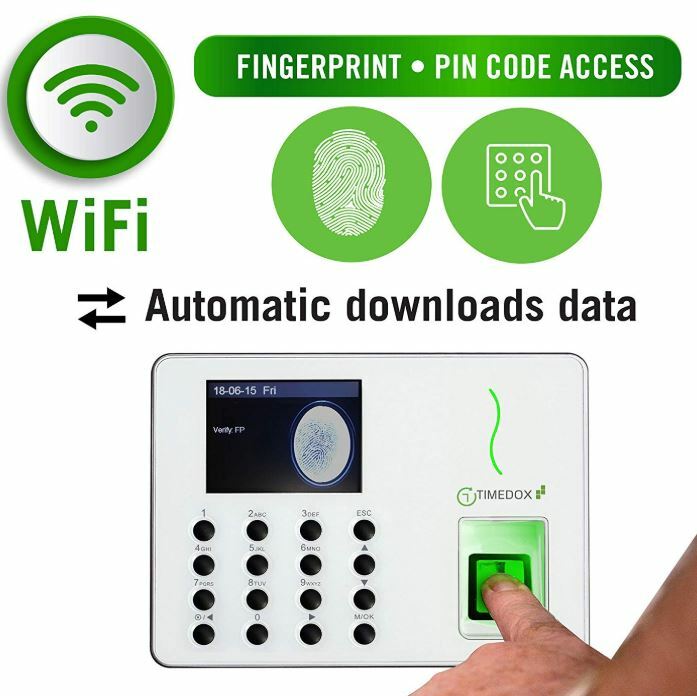 Apart from the fingerprint scanner, a numerical keypad on the front side of the unit can be used to require users to enter a pin code. Above the keypad, there’s a full color LCD that indicates the current time and date during check-in. But you don’t actually spend much time using the screen on the unit itself because of the included software. The Pro Suite Software is capable of letting you access reports from anywhere as long as you’ve got a device with a browser. The software has a 500 user limit, however. Even without the aid of software, the Silver Snow is capable of backing up your previous 50,000 transactions. That’s pretty nice, just in case something happens to your data. For extra security, the Timedox Silver Snow offers their cloud service with a flat monthly rate of $25. 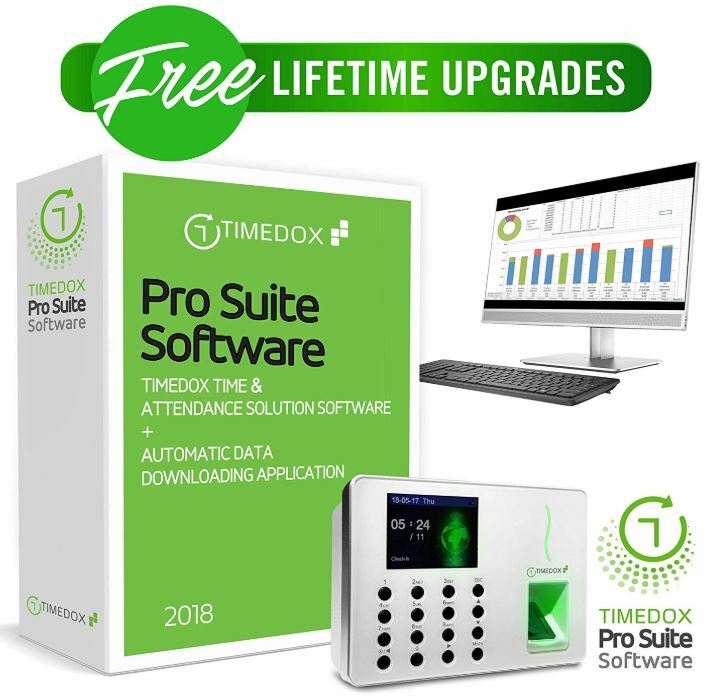 The Timedox system is only compatible with Windows systems. But Mac users can get around this limitation by downloading data from the Silver Snow through a USB flash drive. Those exports include support for the CSV format, and support for payroll reporting features. But if you’re using a Windows system, you don’t need to deal with manual data transfer. The Silver Snow includes a two-year warranty. Timedox also includes unlimited tech support, which can actually come in handy considering the intricate relationship between your data network and the hardware itself. 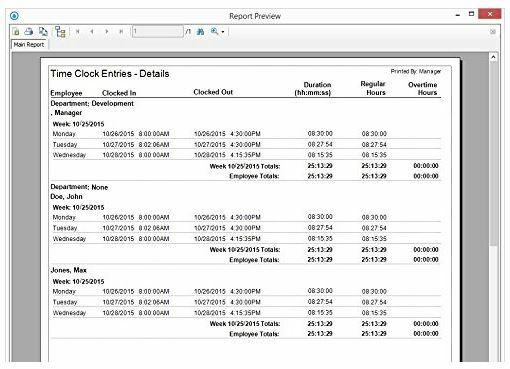 The TimeDrop is supposed to be a streamlined, simplified end-of-day reporting system. The idea is to save time, especially for organizations with more than a couple people clocking in-and-out. Which is why this multi-purpose scanner also delivers pretty compelling support software alongside its biometric scanning abilities. TimeDrop measures 8.2 x 5.8 x 1-inches and weighs about four ounces. Most of that length is actually the cable, which allows it to connect to a broader network of devices without issue. It’s pretty much got the size and dimensions of a large USB stick. That portability is pretty easy to appreciate for people who aren’t doing permanent installations, or have mobile workspaces. Moreover, the reader itself is an exceptionally high quality fingerprint scanner, yielding both high image quality of your prints, and highly encrypted data to protect your security interests. This instrument is intended to work in moist environments, dry environments, and to work for people who have coarse fingerprints. Best of all, it does so without requiring you to do a bunch of math. Moreover, TimeDrop can actually be synchronized with additional TimeDrop units, allowing you to make a wider and more accessible network, and keeping all your data together in one report. Inside those reports, you’ll find attendance monitoring, overtime calculations, employee import/export capabilities, and so forth. 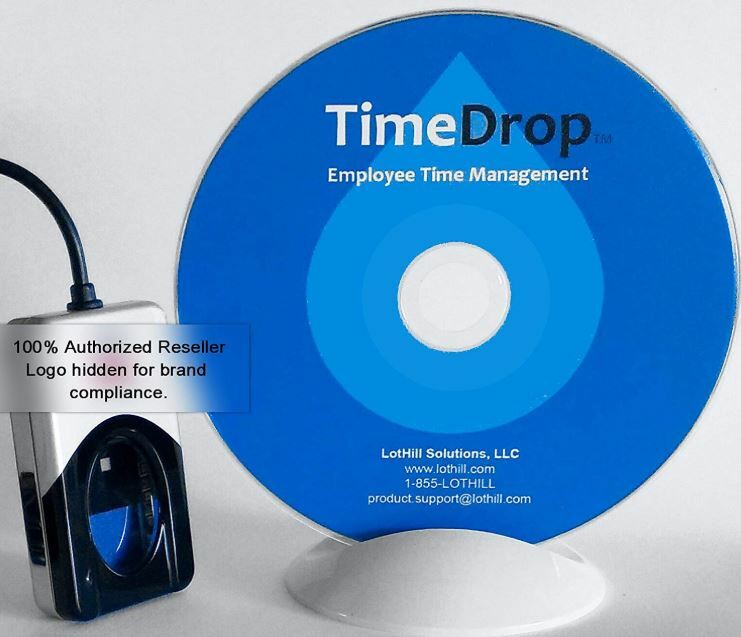 TimeDrop doesn’t come with any subscription fees or hidden costs. Though you will need a computer to run their free software. It includes email support, phone support, and remote desktop support. It also supports an unlimited number of user accounts, which provides infinite scalability. Unfortunately, it does not include support for any platform beyond Windows. Their software supports Windows 7, 8, 8.1, and 10. The AT5000 comes across like a barebones fingerprint scanner time clock, but it’s actually one of the more comprehensive designs on the market right now. It’s actually a combination reader, which collects RFID badges and fingerprint scans. There are only five badges included with the kit, though it’s not hard to acquire more. A maximum of four employee punches per day can be reported through an Excel document, which you can pull from the machine through its USB drive. 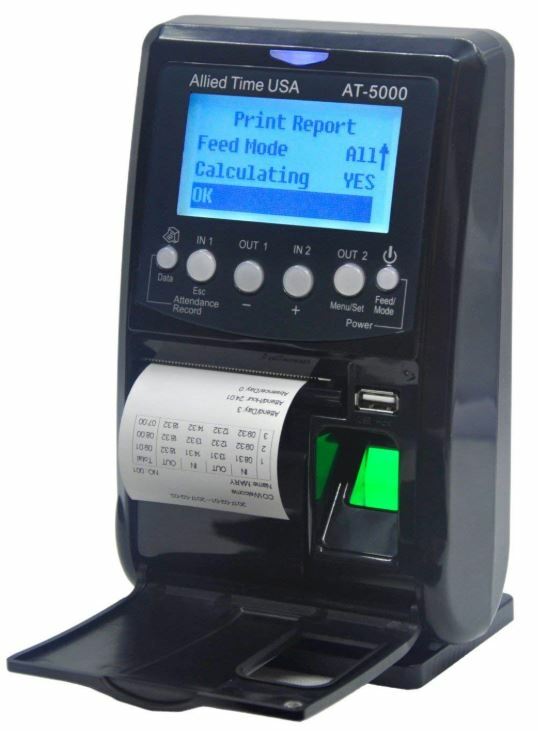 The rest of your data can be pulled from printouts which are ejected from the front side of the AT5000, similar to a receipt. The AT5000 measures 2.5 x 5 x 8-inches, and weighs just over two pounds. On the front face of the unit, you’ll find the interface is mostly intuitive. There are in-and-out buttons, a menu button, power button, data button, and a simple monochrome LCD interface. Beneath the control buttons, you’ll notice a space for your physical prints, which can be torn freely away against a perforated metal lip. The fingerprint console is highly effective, but there is room for complaint. The reader is somewhat recessed within the chassis, which can make it marginally more difficult to wipe down and keep clean. However, that would only become a serious issue if you were planning on using this reader with enormous throughput. This standalone design doesn’t require additional installation procedures, like specialized software. You don’t even have to change your network settings to permit the device. It’s about as simple to setup and install as an ordinary punch clock. For people who don’t want to get involved with a bunch of different software, that’s easy to appreciate. 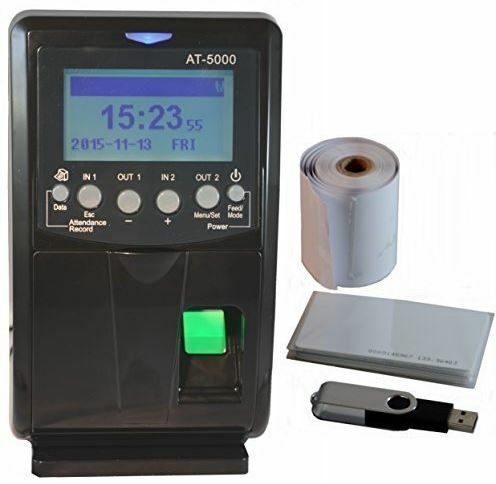 The AT5000 includes 5 RFID badges, a USB memory stick, and a short roll of thermal print paper. It can track a maximum of 200 employees. That puts a soft limit on its capabilities, but one that’s not tough to work around. It’s worth noting the badge is totally optional, users can punch in-or-out with their fingerprint alone. Unless you specify otherwise. Like an ordinary punch clock, the AT5000 will let you know when employees clocked in, and when they clock out. Unfortunately, the AT5000 will not do math for you. You have to calculate employee hours on your own. That’s where having software can help you out. When you print out data, the space that’s allocated to employee names is not really long enough. For someone with modestly lengthy name, like Jeremey Beramey, you’ll find a portion of their surname is cut from the feed. You can get around these issues with the included USB stick, or a USB stick of your own. And it’s really only an issue when two people share almost identical surnames. But it’s something to keep in mind. The Timedox Silver Snow has an impressive and highly adaptable set of features. The software and hardware work beautifully together. Of all the biometric fingerprint scanner time clocks on this list, the Silver Snow takes the most work out of your hands. 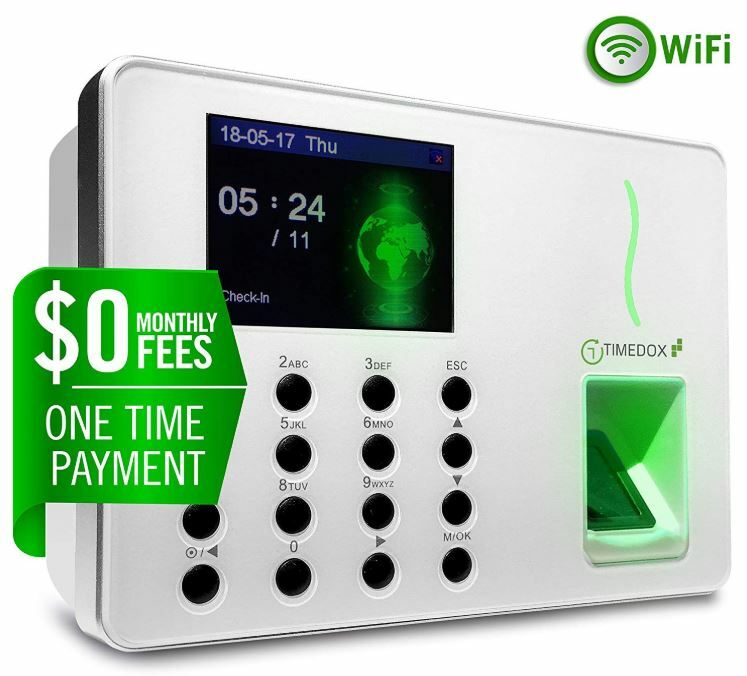 It also has the widest compatibility across platforms, and it’s as easy to setup and integrate into your network as any ordinary time clock. That makes it a great choice for someone who’s looking for an all-in-one type of solution. TimeDrop by LotHill is somewhat basic. It doesn’t include any extra security authentication features, like a badge system or pin-number system. But it does provide a high quality fingerprint reader and all the software necessary to operate it efficiently. This equipment is restricted to the Windows platform, but exporting your data is a breeze. Which makes TimeDrop the right choice for people who prioritize portability, especially for mobile workspaces. Finally, the AlliedTime AT5000 is capable of supporting a staff of 200, but it’s really better suited to smaller businesses with a dozen-or-so employees. Setup takes about 15 minutes, which isn’t bad. But what really distinguishes this time clock is not requiring users to get involved with software, and allowing you to keep physical paper prints of your data. For people interested in simplicity, the AT5000 is the among your best options.